The one room schoolhouse isn’t big enough to hold thirty-four students, let alone the egos of two teachers. He can’t afford to lose the position, and she refuses to lose her heart. Washington, 1891 Humiliated after her broken engagement, Claire Montgomery flees her comfortable life in San Francisco for a teaching position in Pine Creek, Washington, a dot of a town nestled in the rugged Cascade Mountains. She’s determined to succeed—for once in her life—only to discover, upon her arrival, that success will have to be won. Thanks to a school board error, two teachers have been hired. 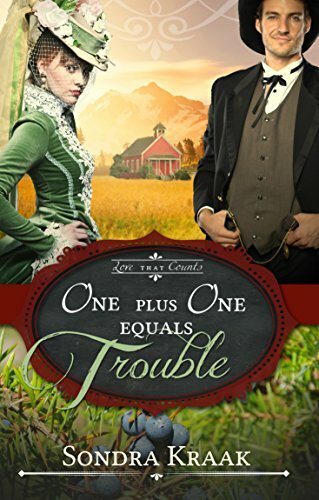 When scandal forces professor Barrett Clarke from his position, he returns to Pine Creek where his uncle, chairman of the school board, sets forth an irresistible offer: teach one year in return for ranchland. For this would-be rancher, nothing is more tempting than resurrecting his childhood dream, and nothing can deter him from earning that land. Except perhaps Claire Montgomery. Losing the battle for the classroom means losing the ranchland, but winning may mean losing Claire’s heart. With large doses of humor and romantic tension, this Christian historical love story offers a picture of grace, forgiveness, and finding true worth. I thoroughly enjoyed this book right from page one. The initial interaction between Claire and Barrett had me smiling and laughing, only making me continue to flip the pages. These two characters are meant for each other--even if they don't want to immediately admit it. The conflict in this book makes sense once you understand each character's backstory. The plot flows at a comfortable pace, filled with moments that have you laughing or cheering on Claire and Bennet. You truly want them both to win the position, but realize they can't! Kraak does an amazing job of making the reader sympathize with both Claire and Bennet, and yet crafts an ending that leaves you happy only one of them receives it. The growth of both characters makes perfect sense and leaves us with a happily-ever-after all romance readers long for. I am happy to not only have found Sondra Kraak and her smooth, witty writing, but also to know this is the first in a series I'm sure to continue reading. You can pick One Plus One Equals Trouble up here just in time for your weekend!